Next, I visit York, the capital of north England from the ancient times and the England's second most important city next to London in the Middle ages. It was a very difficult work for me to select the places of York to pick up in this book. If I were to put many watercolours and write much about York in this book, I would have to prepare a plenty of pages for this city, and I could write another book only about York. King George VI is said to have mentioned that the history of York is the history of England. Learning the history of York required me to learn more about the history of England as well as that of Yorkshire. Once in north England there was a kingdom of the powerful Brigantes, the Celts, which was ruled by Queen Cartimandua and king Ventius. When the Romans marched into this district, a civic war began over the policy toward the Romans in the kingdom, because the Queen was in favour of them but the King was against them. The Queen expelled her husband by force and assumed one of his men as new King. Anti-Roman factions gathering under the former King Ventius, the kingdom was divided and plunged into a civil war. Then the Romans intervened in the war for the Queen and defeated the objectors to cease the war. But after several years, the kingdom was conquered by the Romans completely and then disappeared. 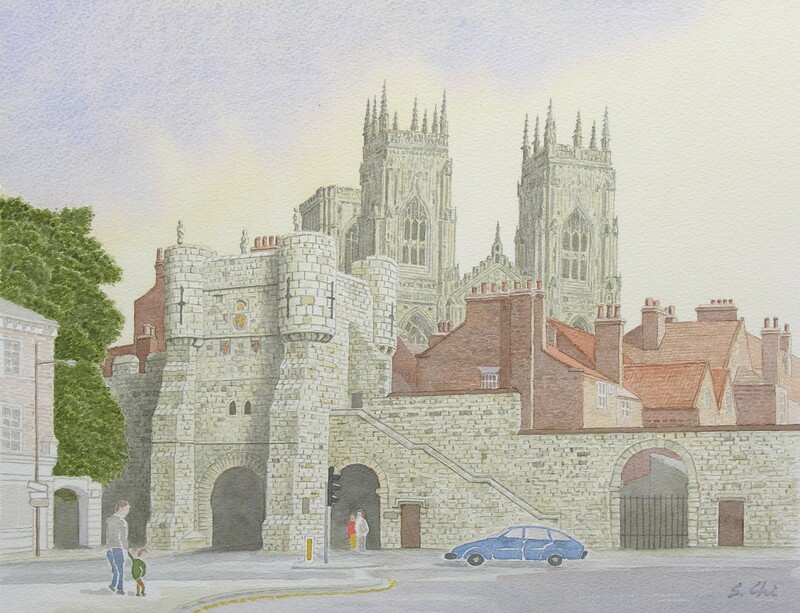 Quintus Petillius Cerialis, the Roman Governor of Britannia, led the 9th Hispana Legion to York from Lincoln in AD 71 and built a fort and stood the Roman Principia, military headquarters, where York Minster stands now. They called it Eburacum. Later, the 6th Victrix Pia Fidelis Legion of the Roman was stationed there. In the days of the Anglo-Saxons, after the 6th century, York was called Eoforwic and became the capital of the kingdom of Northumbria. The Vikings who invaded England, captured and burned down Eoforwic in 866 or 867, and then made it their new trading centre. They ruled this city until 954 when Eric Bloodaxe, the last Viking king was killed by Eadred, King of Wessex at the Battle of Stainmore. The Vikings called the city Jorvik and it is said that this name was changed to York. William I, the Conqueror, defeated Harold II, King of England at the Battle of Hastings in 1066. The following year he started to conquer the north of England. Aware of the strategic importance of York, he built two Norman castles on each side of the River Ouse. In the 13th century, the castle of York and the walls surrounding the town were built. York Minster stands at the very site of the Roman Principia stood. The origin of the Minster was a little wooden church built by Edwin, King of Northumbria in 627. The building of Minster we can see today commerced in 1220 and finished in 1480. It is the largest Gothic cathedral and also the largest Gothic architecture in England. The length of the whole building is 524ft and the breadth across the transepts from north to south is 249ft. The height of the twin west towers is 184ft each, and the lantern tower is 234ft high. York Minster is the Mother Church of the Northern Province of the Church of England and has the throne of the Archbishop of York. It is interesting for me that the position of "the Primate of England" is the second rank of the Church of England. The Archbishop of Canterbury who is entitled "the Primate of all England " has the supremacy. Lanfranc, the Archbishop of Canterbury, subordinated York Minster in 1072. Until then two Archbishops had been equal. York Minster did not yield soon. In 1352 York admitted reluctantly the supremacy of Canterbury. The City Walls surrounding the old town of York extend about 2 and qiuarter miles. They have 6 bars. Five of them, except Victoria Bar, were built in the Middle Ages. Micklegate Bar, Bootham Bar, Monk Bar and Walmgate Bar remain the medieval atmosphere in themselves. When I drove along the A1036 to enter York, I could see the magnificent view of the bar in front of me. 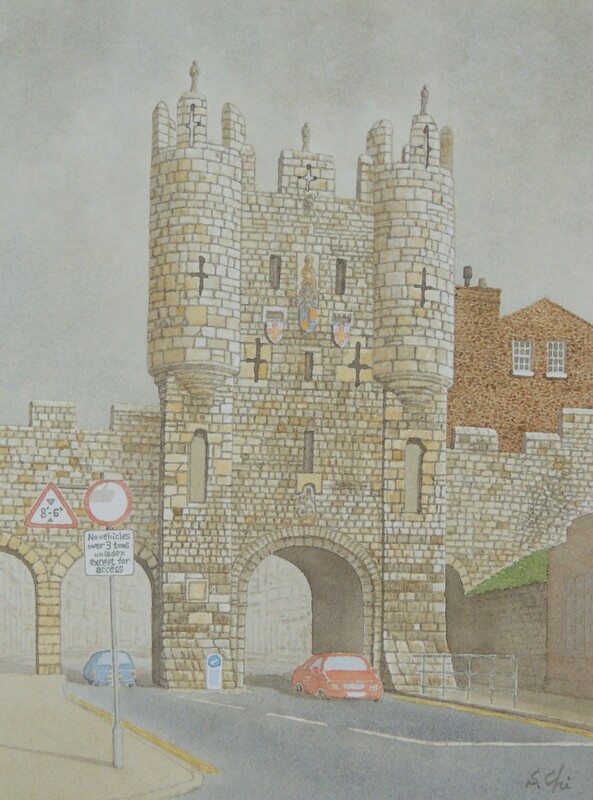 It was Micklegate Bar, which kings passed through when they entred York. Micklegate Bar is a tall bar having the turrets and being crowned with battlements. They are looking down at us and the loopholes are also staring at us. The bars of York look evidently so strong like forts. Among them, Bootham Bar in the north of the walls looks the strongest one, having a turret at each of four conners. The Bars were once fortified with portcullises to stop enemies from entering the city. And the bars were the places where traitor's heads were displayed. The view of York Minster over Bootham Bar was very romantic. When I looked up the Minster over it in twilight, I felt as if I had strayed off into medieval England. The bars of the City Walls of York are the very gates to invite us to the world of the Middle Ages.